All custom airbrush painting and repairs are done in-house and because we are a family-owned business we take great pride in our work. Custom airbrushing is done by Matt Callahan who has been servicing our customers for over twenty years. All paint jobs are very professional and meticulous down to the smallest detail and done at very reasonable rates. Please feel free to call us for a quote. Of if you are in town, visit us at our Hobby Shop at 314 Central Street, Gardner, Mass. We will be glad to give you a personal tour of our paint and repair facility. Store hours are from 10:00 to 6:00 Monday through Friday, 10:00 to 4:00 on Saturdays. Brass is by appointment only, so please call in advance. I have been a model railroader for thirty years and I can relate to your needs. It will be my pleasure to assist you in achieving your prototype modeling needs. 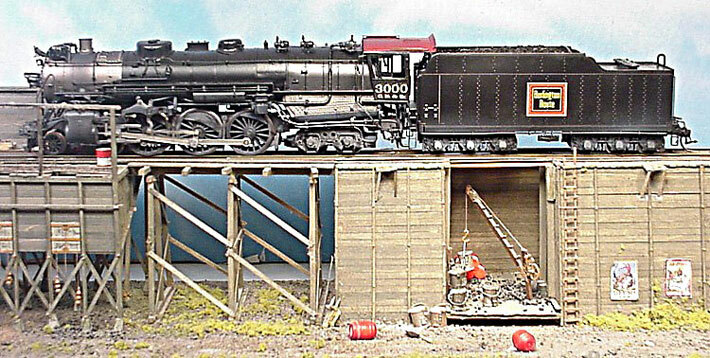 Below is a Frisco 4-8-4 Which we painted for one of our Customers. Below is an example of a Burlington S4 which we painted and lightly weathered.